Stats Insider: Who wins the big one? Who’ll create history in Sunday’s Suncorp Super Netball grand final? 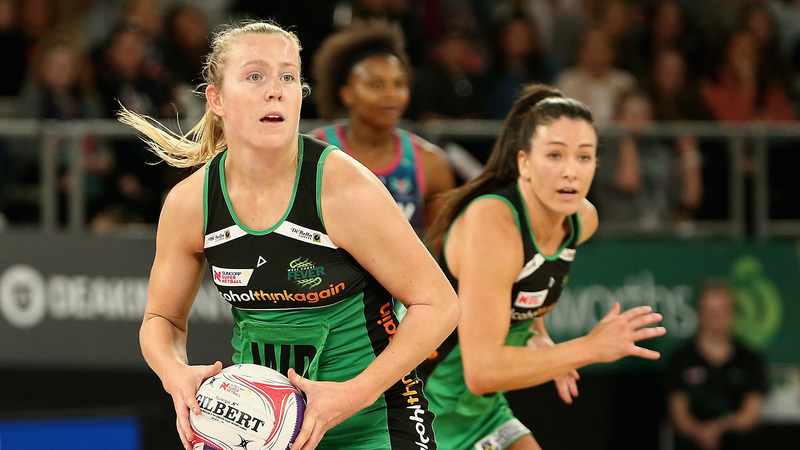 It’s the West Coast Fever and the Sunshine Coast Lightning, with one bidding to snare a maiden national league title, while the other looks to go back-to-back in only its second year of existence. Here’s absolutely everything you need to know about both teams as they prepare to square off in the season decider. GS – Jhaniele Fowler – Has the top five for most goals scored in a game since 2008. Round One and Round Eight this season Fowler scored 66 which is the most. Fowler holds 17 of the top 20 spots. GA – Nat Medhurst – Will be playing her 220th game this Sunday. Has feed the shooting circle 560 times. Is averaging 37 per game so is on the verge of 600 in a season. WA – Ingrid Colyer – Is the Fever’s go-to player for centre pass receives with 305 so far this season, which is sixth in the competition. Colyer has fed the circle 255 times, taken six intercepts and picked the ball up 14 times. Considering how often Colyer has the ball in her hand, it’s incredibly impressive that she has only thrown seven bad passes and 10 intercepted passes. C – Verity Charles – Needs two feeds to break 400 for the season and seven goal assists for 250 for the season. Also has 14 intercepts. WD – Jess Anstiss – The youngest player on court, Anstiss has 43 goal assists, 66 feeds, 88 centre pass receives, 12 intercepts and 29 deflections. GD – Stacey Francis – Has played every minute of this season. Francis has 119 centre pass receives, 24 intercepts (eighth in competition), 56 deflections, 25 pick-ups, 11 rebounds and 46 gains. GK – Courtney Bruce – The Fever captain excels in all the main stats for a goal keeper. She is first for gains with 98, first for defensive Rebounds with 31, second for intercepts with 43 and second for deflections with 92. GS – Caitlin Bassett – Will attempt her 700th goal this week as she currently has 683 attempts for 630 goals. Is averaging 42 goals from 45.5 per game for a shooting percentage of 92.2%. GA – Steph Wood – Has played every minute of this season and needs 19 goals to score 300 for the year. Currently has 275 goal assists – averaging 17 per game. WA – Kelsey Browne – The shortest player in Suncorp Super Netball at 164cm. Browne has received the centre pass 283 times and fed the ball inside the shooting circle 467 times. And she has only thrown eight bad passes. C – Laura Scherian – Will play her 50th game spanning three competitions (14 games in the Commonwealth Bank Trophy, three games in the ANZ Championship and 32 games the Suncorp Super Netball). WD – Madeline McAucliffe – A consistent performer across all areas of the court, McAucliffe has 19 goal assists, 35 feeds, 51 centre pass receives, 15 intercepts and 40 deflections. GD – Karla Pretorius – In two seasons has become a defensive powerhouse. Pretorius leads the competition for intercepts with 48 and is second for deflections with 72. Last season Pretorius finished the season with 37 intercepts and 52 deflections. GK – Geva Mentor – Currently has 112 deflections for the season. Thirty of those deflections have led to a gain. Is second for defensive rebounds with 38. The Fever have both the oldest player and the youngest player playing. Nat Medhurst, at 34 years and seven months is the oldest and Jess Anstiss is the youngest at 21 years and nine months. But the Lightning have an older average age for their starting seven at 28 years and two months. The Fever have never lost this season when leading at three-quarter time. They are nine from nine. The Lightning are on a six-game winning streak. The last time they lost was in Round 10 against the Fever in Perth by a goal. Don’t expect many team changes. 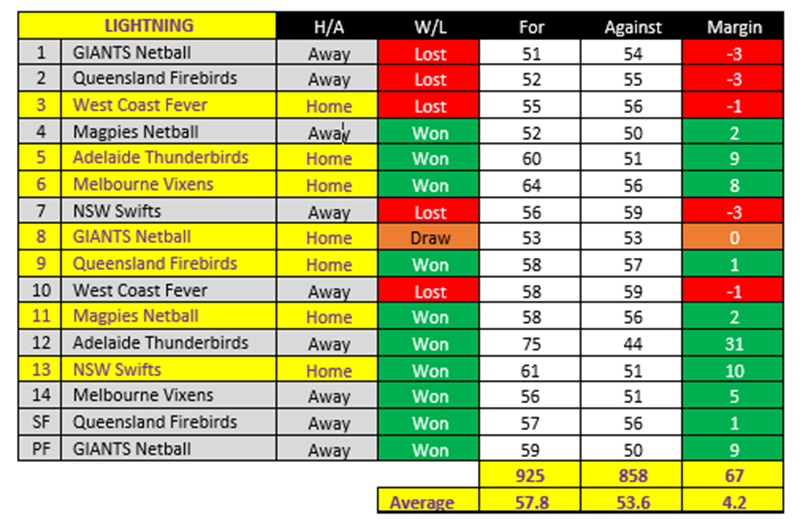 The Fever have never used all 10 players in a game and average 5.3 positional changes per game. The Lightning make even less with only 2.6 positional changes per game and have used only their starting seven on eight occasions. 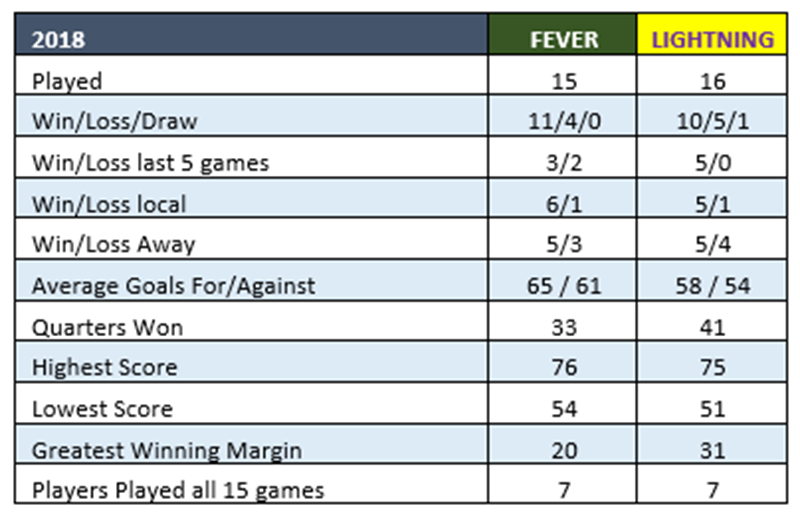 The Fever start fast with a goal difference of +26 for their first quarter but drop off considerably in the second quarter with only a +4 goal differential. The Lightning’s start is usually slow but their middle two quarters are their strengths. Their second quarter has a goal differential of +25 for a win percentage of 75% and their third quarter is even better with a goal differential of +29 with an 81% win percentage. Playing one less game than the Lightning, the Fever have still scored 50 more goals. They are averaging 65 goals per game with a shooting percentage of 91.3%. The Fever have scored the most goals from their own centre pass (718) and gains (144) but are only seventh for goals from opposition turnovers (113). 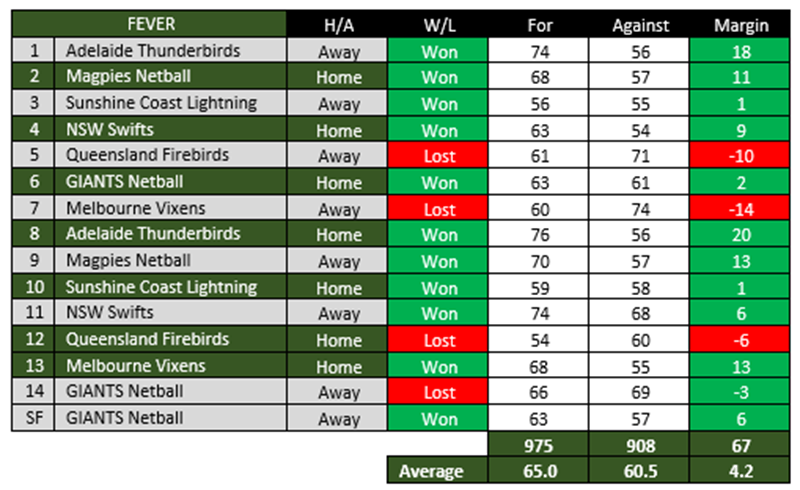 The Lightning are very consistent across all three avenues to goal – second for goals from their own centre pass (658) and gains (140) and third for goals from opposition turnovers (127). The Fever are sixth for offensive rebounds with 38 but this is due in large part to the fact they have an extremely high shooting percentage of 91.3%. They are, however, first for defensive rebounds with 42. The Lightning are first for deflections with 257 and deflection gains with 57. This means 22% of the Lightning’s deflections lead to a gain. The Lightning have used the timeout option the most with 45, equating to 2.8 per game. Big games bring out the best in big game players, so with both teams littered with superstars, this game will be a shootout. The Fever have been the benchmark all season and were finals bound almost from the first whistle. 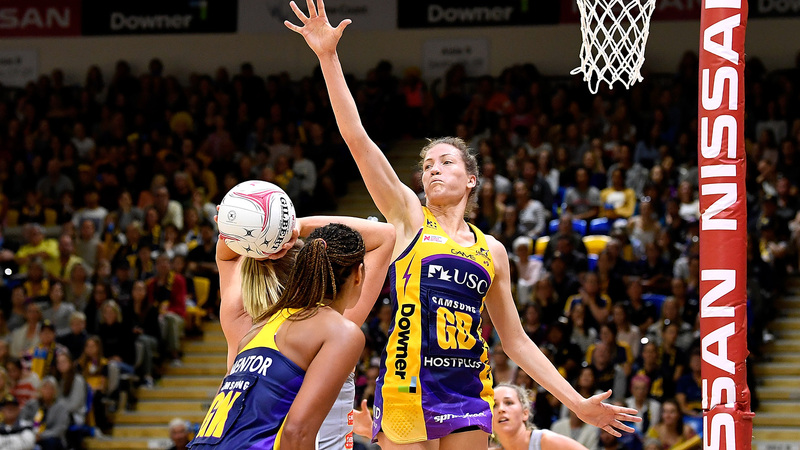 The Lightning’s path to the grand final has been a little more bumpy, having to fight their way back into the competition after dropping their first three games. But the Fever’s run into the grand ginal has been a Win/Loss/Win/Loss/Win pattern whereas the Lightning’s has been Win/Win/Win/Win/Win/Win. There will be a massive Perth crowd experiencing finals netball for the first time, which will no doubt play a very significant role, but I think the Lightning’s battled-hardened winning run and experience will be enough. CHAMPION DATA’S TIP: Lightning by two.